Spondylosis (synonym spondylosis deformans) is a chronic disease of the spinedue to degenerative changes of intervertebral disk and calcification ligamentous apparatus in places snap to the edges of the vertebral bodies. Calcified cartilage transformed into bone growth. Spondylosis occurs due to degenerative changes in the spine (the intervertebral disk, ligaments, surfaces of the vertebral bodies) and normally observed in elderly and senile age. Development spondylosis contribute constitutional predisposition and, apparently, heavy physical work. In addition, spondylosis as secondary infection may occur in different terms after trauma, infection or other disease. Typical spondylosis changes may develop in any spine, but more often affected the lumbar spine with the greatest functional load and overload. Clinical manifestations spondylosis different. It may be hidden, and discovered accidentally by x-ray taken on another occasion. Some patients spondylosis noted unstable back pain, aggravated by adverse weather conditions, fatigue, limited mobility of the tilt and turns of the body or head. Objective examination signs of infection may be missing or the detected reducing the amount of motion of the spine, pain effleurage or palpation of the spinous processes, as well as a sharp movements. In some cases, the basis of the clinical picture when spondylosis are the symptoms of sciatica (see) or plexitis (see). Spondylosis (x-rays): left - sharpening and bony prominences on the edges of the bodies of the lumbar vertebrae; the right connections connecting the lumbar vertebrae massive bone "brackets". Intervertebral disks saved. X-ray examination allows you to set spondylosis, to determine the prevalence and severity of morphological changes. X-rays of the spine is produced in two projections to judge the state of all departments of the vertebral bodies. The main radiological sign spondylosis - osteophytes (see) on the edges of the vertebral bodies, i.e. calcification of ligaments. They can be as small points, beaked ledges or massive "parentheses" (Fig. ), connecting body adjacent vertebrae. For spondylosis sometimes characterized by a mismatch radiological and clinical data. 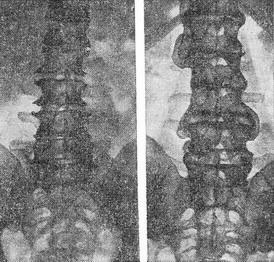 Often when extensive changes on x-rays of the spine clinical signs of disease expressed little or non-existent. However, the symptoms of sciatica or plexitis can be detected at very reasonable changes of the spine on radiographs. The disease lasts for years, progressing slowly; because of the growth of osteophytes, the formation of fixing units of various motor segments of the spine with the progression of deformation above and below the level of the resulting block. Treatment: rational mode to prevent overload of the spine and hypothermia, physiotherapy (paraffin-ozokerite applications, iodine-calcium-electrophoresis, diathermy, and in the early period of the disease ultrasound on the spine area), massage, Spa treatment (mud treatment, hydrogen sulfide, radon and other baths), and with a sudden pain - analgesic funds. An important place in the treatment of spondylosis is gymnastics.